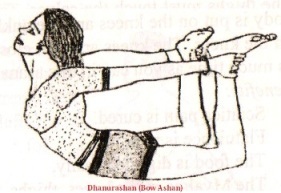 Dhanur Aashan (Bow asan) : Spread a woolen blanket on the floor or hard bed and lie down on your stomach like bow shape . Keep the legs straight and joined together and bend your feet upward then catch both the feet firmly with your both hands. Apply the force of stretching the arms and feet then lift up your upper torso and the feet as much as you can in the arc shape along with a inhale breath. Hold the breath and retain the posture as much as you can comfortably. Then slowly lower the chest, neck, head and your feet on the ground along with exhale breath. Relax the whole body with deep breathing. This entry was posted in Smart astro guru, Yoga & Kundalini Shakti and tagged benefits of Bow asan, benefits of dhanurasan, Bow asan, Dhanurasan by R. N. Sharma. Bookmark the permalink. I was more than happy to discover this page. I need to to thank you for your time due to this fantastic read!! I definitely enjoyed every bit of it and I have you book-marked to look at new things on your site. When I first saw this title Dhanurasan or bow asan and its benefits | Smartastroguru on google I just whent and bookmark it. The new Zune browser is surprisingly good, but not as good as the iPod’s. It works well, but isn’t as fast as Safari, and has a clunkier interface. If you occasionally plan on using the web browser that’s not an issue, but if you’re planning to browse the web alot from your PMP then the iPod’s larger screen and better browser may be important.